Matthew Bunker Ridgway was born at Fort Monroe, Virginia, on 3 March 1895. He graduated from the United States Military Academy in 1917 and was commissioned a second lieutenant. Promoted to first lieutenant and then temporary captain, Ridgway was assigned as a company commander of the 3d Infantry. From 1918 to 1924, he taught Spanish at West Point. In 1919, he was made a permanent captain. He served with the 15th Infantry in China and the 9th Infantry in Texas from 1925 to 1927. Ridgway then served on the American Electoral Commission in Nicaragua and on the Bolivia-Paraguay Commission of Inquiry and Reconciliation until 1929. In 1930, he married Margaret Wilcox; for the next two years he served with the 33d Infantry in the Panama Canal Zone. In 1932, he was promoted to major. In 1935, he graduated from the Command and General Staff School at Fort Leavenworth, and in 1937, from the Army War College. From 1939 to 1942, Ridgway served in the War Plans Division of the General Staff. In 1940, he was made a temporary lieutenant colonel. During 1941 and 1942, he was promoted to the temporary ranks of colonel, brigadier general, and major general. 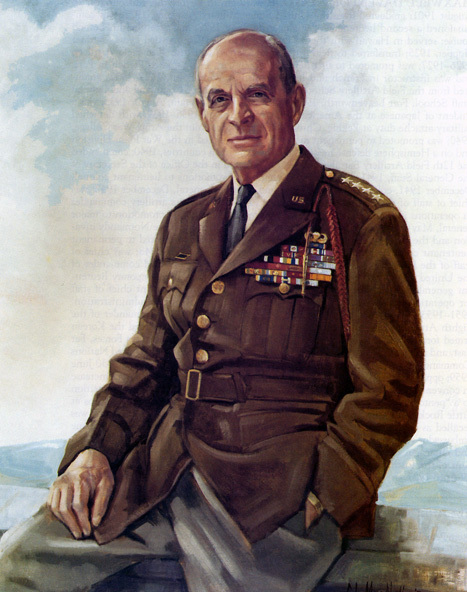 Ridgway led the 82d Airborne Division in Sicily, Italy, and France until 1944; he then commanded the XVIII Airborne Corps in Europe through 1945. In 1945, he was promoted to temporary lieutenant general. After the war, Ridgway served as the commander of the Mediterranean Theater of Operations and deputy Supreme Allied Commander in the region. He married Mary Anthony in 1947. From 1946 to 1948, Ridgway was the U.S. representative to the United Nations Military Staff Committee and chairman of the Inter-American Defense Board. Ridgway led the Eighth Army in Korea from 1950 to 1951; when President Truman relieved General MacArthur of command in Korea, Ridgway became the Supreme Allied Commander in the Far East. He was promoted to full general in 1951. From 1952 to 1953, he was Supreme Allied Commander in Europe. Then he served as Army Chief of Staff from 16 August 1953 to 30 June 1955. As Chief of Staff, Ridgway dealt with postwar demobilization, the training of the South Korean army, strengthening the North Atlantic Treaty Organization, and crises in Formosa and Indochina. Ridgway retired from active service in 1955. He died on 26 July 1993, in Pittsburgh, Pennsylvania.